Parachutes don’t just save lives in the air. People on the ground can count on the safe delivery of valuable cargo with just one of our many non-personnel parachutes, which includes cargo, extraction, and deceleration parachutes. 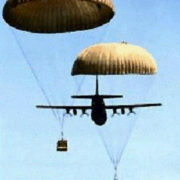 Mills Manufacturing is one of the premier providers of cargo parachutes in the United States. Used by each branch of the US Armed Forces, cargo delivery systems can deliver both light and heavy goods, such as ammunition and vehicles, to drop-zones where they are in high demand. 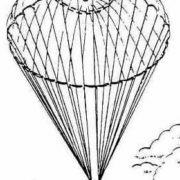 Cargo parachutes, which can carry anywhere between 100 and 42,000 pounds, are made with the most advanced cargo delivery technology. 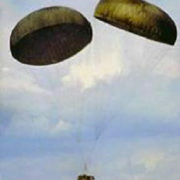 Many of the cargo parachute assemblies developed in the late 1940s and early 1950s remain the mainstay of airdrop and recovery operations. Minor modifications fine tuned their efficiency, but their elegant design withstands the test of time. Only one model, the 34 ft. diameter G-14 developed in the mid-1960s, has replaced the 24 ft. diameter G-13. A high quality, state of the art cargo chute is key to the success of many ground missions, whether they are military, humanitarian, or commercial. This is why it is important to find a cargo chute manufacturer that has experience, knowledge, and a expert level of craftsmanship. We offer a full line of basic military parachutes and can customize a parachute to meet your individual needs. Component parts for all cargo assemblies can be supplied separately. Please contact us to request the parts number list, get pricing information, or learn more about our custom services.